a Unión de Prácticos del Canal de Panamá advirtió que no están capacitados para operar las embarcaciones postpanamax. 29/05/2014 - La Unión de Prácticos del Canal de Panamá advirtió que no están capacitados para operar las embarcaciones postpanamax que transitarán por las nuevas esclusas del proyecto de ampliación. En una exposición ofrecida esta mañana en la sede del gremio ubicada en Ancón, el secretario general de los Prácticos Rainiero Salas dijo que aunque la ampliación está atrasado, los prácticos no han tenido la capacitación necesaria para maniobrar los buques postpanamax. A diferencia de las esclusas actuales, que operan con el uso de locomotoras para que las embarcaciones transiten por la vía, el Canal ampliado usará remolcadores dentro de la cámara. Este sistema cambia totalmente las operaciones y aunque se utiliza en otras partes del mundo, es necesario que el personal esté lo suficientemente capacitado para evitar accidentes, añadió Salas. La Autoridad del Canal de Panamá ha informado, anteriormente, que espera completar la capacitación de los prácticos cuando se termine de construir la nueva esclusa en el Atlántico, donde se prevé estará primero que la del Pacífico. "Es más fácil llegar a la Luna que construir un canal en Nicaragua"
Sin embargo, él resta importancia a esas dudas, según informa la agencia de noticiasReuters, que lo entrevistó en Pekín, y asegura que los planes marchan según lo previsto. Pero Coronel Kautz explicó a BBC Mundo que "los impactos del proyecto están siendo estudiados por una empresa británica que se llama Environmental Resources Management(ERM), que es independiente completamente, y es una de las empresas más prestigiosas que se conocen, así que eso está cubierto". "Con motivo de los 100 años de la inauguración del Canal de Panamá la Embajada de Estados Unidos en Panamá presenta 100 láminas resaltando los hechos históricos, personajes y anécdotas relevantes de la historia conjunta de nuestros pueblos." El canal es una pieza fundamental en esta relación de cooperación. Debido a la compleja situación política de Panama en el año 1902, El gobierno Estadounidense, presidido por el Presidente Theodore Roosevelt, se inclinaba por construir un canal interoceánico por Nicaragua. Sin embargo, los detractores criticaban la opción nicaragüense debido al peligro que representaba la actividad volcánica en el país. Sabiendo esto, el ingeniero Francés Bunau-Varilla cambió la historia al mandar una carta a todos los senadores americanos con estampillas que mostraban el volcán Momotombo de Nicaragua en plena erupción. Esta táctica sirvió para convencer a los senadores de votar a favor de Panamá, ya que parecía una opción mucho más segura y estable. 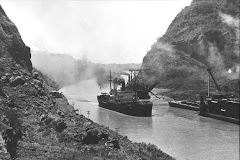 Due to the complex political situation in Panama in the year 1902, the Government of the U.S., presided over by President Theodore Roosevelt, was inclined to build the Interoceanic canal in Nicaragua. 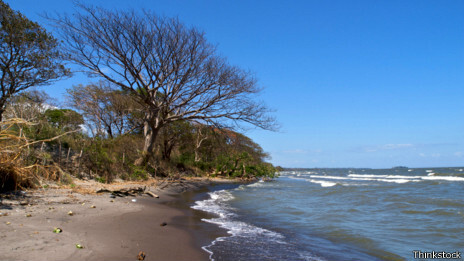 However the detractors criticized the Nicaraguan option because of the danger posed by volcanic activity in the country. Knowing this, the French engineer Bunau-Varilla change history by sending a letter to all American senators with stamps showing Nicaragua's Volcano “Momotombo” in full eruption. This tactic convinced the Senators to vote in favor of Panama, which seemed a much safer and stable choice. 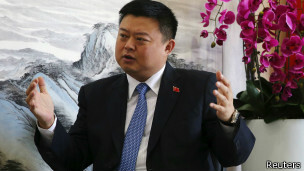 BEIJING (Reuters) - Wang Jing, the enigmatic businessman behind Nicaragua's $50 billion Interoceanic Grand Canal, shrugs off scepticism about how a little-known entrepreneur can be driving a huge transcontinental project, insisting he's not an agent of the Beijing government. "I know you don't believe me," said Wang, who reckons that he's forked-out about $100 million in canal preparation work, and is burning as much as $10 million a month on the project. "You believe there are people from the Chinese government in the background providing support. Why, in the end, is only Wang Jing out front?" High-ranking Chinese officials including President Xi Jinping, Premier Li Keqiang and former leaders Jiang Zemin and Wen Jiabao have all visited the state-connected wireless communication technologies company Wang took control of four years ago. Wang, whose entrepreneurism went mostly unnoticed in China and elsewhere before last year's Nicaragua announcement and a subsequent $3 billion Black Sea port development plan, has not helped matters by refusing to talk in detail about himself or broad swathes of his career. During two interviews at the headquarters of Beijing Xinwei Telecom Technology Inc and in several follow-up emails, the 41-year-old Wang discussed Nicaragua, Beijing Xinwei's recent deal to undertake the biggest reverse takeover in Chinese stock market history and his background, providing fresh details to a life that remains mysterious. "I was born in December 1972 in Beijing," said Wang. "All these years I've lived a very ordinary life." Wang grabbed global headlines last June when he sealed a controversial no-bid 50-year renewable concession from Nicaragua's Sandinista government to develop the $50 billion canal to rival Panama's, and related facilities. Nicaragua preparation is on schedule, Wang said. In January, he and President Daniel Ortega issued a joint statement to address what Wang described as "misleading reports" that the start of construction would be delayed. The proposed scope is enormous, comprising construction of a waterway that may extend 130 miles, depending on the route selected, along with two ports, a railway, oil pipeline, and an international airport. The canal would be longer, deeper and wider than the Panama Canal, about 500 miles to the southeast. The scale of the project has led some to suggest it could only be viable with the backing of the Chinese government, which might see it as a geopolitical play to balance U.S. influence in Central America. "I can't imagine (Wang) would have gone forward without at least coordinating with the Chinese government," said R Evan Ellis, assistant professor for Hemispheric Defense Studies at National Defense University in Washington. "Big Chinese companies just don't parachute down into Latin America." The project, Ellis estimates, may provide China with commercial leverage over key Latin American governments and local companies, which may prove crucial to guarantee trade routes and access to raw materials. "How the project ends will likely depend on the government of the People's Republic of China," he said. For Wang, who can make a small fortune from licensing arrangements alone, the project represents a perilous highwire act. The ocean-connecting waterway has been criticized as the proverbial white elephant, while Wang has been ridiculed in the global press for lacking experience developing or financing big infrastructure. Wang only established Hong Kong Nicaragua Canal Development Investment Co (HKND) in August 2012 and opened offices in Hong Kong's premier International Financial Center weeks ahead of the June 2013 announcement. 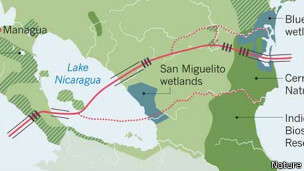 Nicaraguan opposition politicians also question Wang's commitment to addressing social and environmental issues, particularly how the proposed project may affect Lake Nicaragua, an important freshwater source in the region. Wang has brought in international specialists to help quell concerns. McKinsey & Co was hired to conduct an economic feasibility study, while Environmental Resources Management Ltd is conducting an environmental and social impact study for the various routes under consideration. SBE, the Belgium-based civil engineering firm specializing in canal hydraulics, and MEC Mining, the Australia-based engineering consultancy also have been hired. Washington consultancy McLarty Associates and law firm Kirkland & Ellis also were contracted. 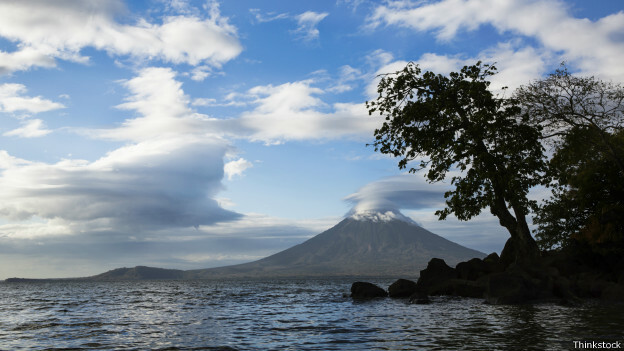 As many as 400 engineers and technicians of different nationalities are currently working on a canal feasibility study, Nicaragua's Canal Authority head Manuel Coronel Kautz told Reuters. There are between 600 and 700 people working on the project, Wang said. McKinsey & Co infrastructure partner Stefan Matzinger declined to answer questions. ERM regional chief David McArthur, McLarty Associate's managing partner Stephen Donehoo and Kirkland & Ellis partner Chuan Li did not respond to emails or telephone calls. Financing is a thornier issue. Wang, who may be prepared to spend as much as $300 million of his own cash, said that he will use a combination of cross-shareholding, bank lending and debt issuance to raise the estimated $50 billion needed to finance the project. Five international groups had already agreed to invest in the project, he added. "We have not only signed memorandum-of-understanding, we are working on final preparations for executable, irrevocable contracts," he said. On April 23, Xugong Group Construction Machinery Co., one of China's biggest construction equipment manufacturers, announced it had reached a framework agreement to take a 1.5 to 3 percent stake in Wang's development company. No dollar amount was attached to the investment, which also would make Xugong the sole supplier of engineering equipment to the canal project. More announcements are expected in the coming weeks, Wang said. Other companies that may participate in an international consortium include state conglomerate China Railway Construction Corp., China's biggest overseas engineering contractor, which is one of Wang's strategic partners that has been brought in to help with feasibility studies. Wang said that he has spoken with Chinese state-owned banks but would not say whether any would provide financing. "I want to point out that it isn't going to take $50 billion in cash to do this," Wang said. Wang's other big infrastructure project, a $3 billion plan to build a deepwater port on the Black Sea about 60 km (35 miles) north of Sevastopol, is facing greater uncertainty. In December, Wang announced the agreement between HKND and an unknown Ukrainian firm during a visit to Beijing by Ukrainian President Viktor Yanukovich, who was ousted two months later. A photograph captures Wang at the time talking about the port project with Yanukovich and China's Vice Premier Ma Kai. The port site is located in the middle of the Crimean peninsula that has been annexed by Russia. By February, 20 HKND workers had completed their site inspection work and were forced to return to China. "We're still confident, but given the current complexity of the Ukraine situation, in terms of our procedures, our schedule and our rhythm, we will need to replan," Wang said. Wang looks flush with cash - at least on paper. His main asset is a 36.97 percent stake in Beijing Xinwei, the government-backed developer of China's wireless communications standard that now specializes in mobile network development and products. Beijing Xinwei in March estimated its assets at 26.89 billion yuan. Separately, Wang controls Hong Kong Nicaragua Development Co, a Hong Kong registered firm, through mainland-registered Beijing Interoceanic Canal Investment Management Co, according to filings with the Shanghai Stock Exchange and Hong Kong Companies Registry. Wang also reports full ownership of several offshore subsidiaries, including seven Netherlands firms related to the Nicaragua project; a British Virgin Islands-registered aircraft investment company, and media and sports entities, all of which were registered within the last year. He owns Southeast Asia (Cambodia) Agriculture Development Group Inc, which was registered in Cambodia in September 2009, according to Shanghai Stock Exchange filings. Less is known about Wang's path to success. The youthful chief executive refused to discuss his family background, saying only that his father was an ordinary office worker and died in 2010 following an 11-year illness; his mother, who is about 70 years old, is retired; and that he has a daughter. "It's that simple," said Wang. "I'm very ordinary." Wang says he studied at Jiangxi University of Traditional Chinese Medicine but left before graduation, returning years later to organize Beijing Changping Traditional Health and Culture School. In the late 1990s, Wang said he traveled to Hong Kong to learn about international finance and investment. He returned to Beijing in 1998 and founded Dingfu Investment Consulting Co. In Hong Kong, Wang also established Hong Kong Divine (Dingfu) Investment Group Ltd in 2001. He later mined gold and precious stones in Cambodia - a process he described as slow and exacerbated by the legacy of past wars - and opened Yingxi Construction and Engineering Co, a small contractor that participated in projects in Beijing, Tianjin and Guangdong. Available information about these firms is scarce. Wang declined to elaborate on the source of his wealth. "China has an expression 'the finest fragments of fox fur, sewn together, will make a robe', the meaning of which is a fortune is accumulated over time," he said. PANAMA CITY (Reuters) - Panama's vice-president, running as an opposition candidate, took an early lead in Sunday's presidential election after a campaign in which he took credit for outgoing President Ricardo Martinelli's policies but vowed cleaner government. Juan Carlos Varela of the center-right Panamenista Party (PP) helped Martinelli get elected in 2009 but later fell out with him and has vowed to cut the cost of living and reduce poverty. Varela had 38.87 percent support with votes counted from around 25.7 percent of polling booths, Panama's election authority said. Ruling party contender Jose Domingo Arias had 31.86 percent, while left-leaning former Panama City mayor Juan Carlos Navarro of the Democratic Revolutionary Party (PRD) had 27.97 percent. It was not immediately clear whether the ballots counted were representative of the vote on a national level. The winner will inherit oversight of a major expansion of the Panama Canal, which briefly stalled earlier this year after a row over costs between the canal and the building consortium. The election campaign has focused more on personalities than policy, which is not expected to change dramatically regardless of who emerges as the winner. Many voters voiced dissatisfaction with the ruling Democratic Change's (CD) Arias, whose running mate is Martinelli's wife and who is seen by opponents as a proxy for the outgoing president. "I think most of the country is against re-election in disguise," said lawyer Pablo Jiustiani, 34, in Panama City's up-market San Francisco neighborhood, shortly before polls closed.